Last week, Cooper spent an early weekend morning trying out for a summer baseball league. Depending on his performance that day, he would be drafted to play either the local team (“sandlot”) or the travel team (“self-explanatory”). My Cooper loves him some baseball — but, mostly, he loves to play ball with his friends. He didn’t seem to care where he ended up, so long as his buddies were by his side. 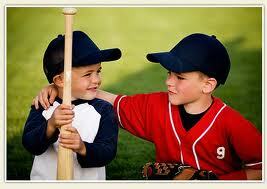 Come to find out, he was picked for the competitive travel team, but most of his friends got into the Sandlot league. So Ray and I gave him the choice — it’s summer, after all. He’s nine years old. The point of playing is to have fun. Did he want weeks of on-the-road playing-to-win competition? Or in-town games? If he wanted the challenge, we were on board. If he wanted casual games with local friends, well, that was awesome too. We left it entirely up to him. After a few hours of consideration, brows furrowed in serious thought about what he wanted — to play to win, to play to laugh — he let us know. “I want to be with my friends,” he said. “I just want to have fun.” Sandlot it was. Secretly, I’m glad. I know that my kid has a natural athleticism and affinity for sports, and while I recognize that he’s not a nine-year-old phenom, I’m not surprised that he often gets picked toward the top. It makes me proud to see him perform effortlessly, and a little part of me wants to encourage him to challenge himself, to be better, to excel, to tap into that inherent potential I see buzzing through his entire body. But, at the end of the day, I don’t care about that. Because for me, sports is about fun, not competition. Yes, I understand that at some point you play to win, but, being me, a sort of granola-munching, Kumbaya-singing Mom, I just want everyone to play. Play. As in, be joyful. Smile. Cheer. Whoop-holla-woot! That’s why I am so glad that Ray coaches. Even though sometimes I get a little nuts watching, I know his heart is always — and first — with the boys. Both he and our team’s other coach each take his role seriously enough to help the team improve their skills and understand the game, but always, always, playing is about having a good time. And even though it seems that, around here, draft season is a big deal for a lot of coaches, when Ray picked the team, he not only chose boys with strong skills, he also chose boys who were friends. Kids who would enjoy playing together. Boys who hung out with each other in their free time — even if their abilities are not on the same level as some of the others. I think he chose very, very well. We’re nearing the end of baseball season. Last night our little purple-wearing team played a great game — their opponents were a fairly even match for us, and all the kids did well, even if, in the end, our team lost by one run. I could see the improvement from a couple of months ago, the solid hits and the well-executed fielding, the way that all the boys are starting to remember where the play is without being reminded, and working together to get the job done. Best of all was seeing the giant grins on the faces of boys who, for the first time this season, got a few RBIs or remembered to throw to the cutoff man or touched home plate. If only we could figure out how to help kids to hang on to that feeling.